This album was released as free download packs with the band encouraging fans to create their own physical copies with provided templates. "This album is FREE. Free as in, free. Free to download and if you wish, free to make copies. Make tapes, make CD’s, make records. Ever wanted to start your own record label? GO for it! Employ your mates, press wax, pack boxes. We do not own this record. You do. Go forth, share, enjoy." Jeeezz! I had some expectations but when I firstly started to play "Crumbling Castle" you just get involved straight away, deep bass, clear effects and guitars - everything there where it should be. When the tracks are settling down it just became more listenable, enjoyable. Gatefold gives you some extra to lay on. Fantastic record comes with good mastering on a 180g black vinyl. This is an amazing pressing. Aural Pleasre really did this right. Order without hesitation. Gotta say, out of the many (twelve!) 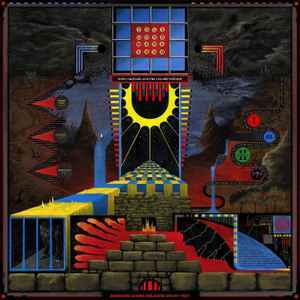 different pressings I have of Polygondwanaland, this is one of the most impressive looking by far, and is also amongst the best sounding. Really impressed. Still available on the Lazy Boy site as of February 2019. Definitely not half-speed mastered. Sounds great, nice packaging and all, but yeah. Plays at a standard 33 1/3. The records outer sleeve is Super tight. I ended up tearing it down the seam. not too much, but it's there. 1. Pozible took roughly a month to transfer all of the payments to me. Half of them went to my bank account, the other half to my PayPal. Both times, the payments halted halfway because there was so much money being transferred at once. This was the biggest factor in the wait. 2. Random people's shipping info or nicknames were completely missing from the data spreadsheet of orders that Pozible sent over to me. ********* has been very graciously helping me hack through these. 3. Throughout all of these problems, the wait time for a response from a Pozible staff member is approximately 2-3 days (not including if it's the weekend). There were a lot of concerns and doubts raised by my last post, due to the amount of time (and delays) it’s taken for this pressing to get shipped. I would like to clear things up and be completely transparent with you all, in hopes that I can ease everyone’s worries. You will find attached the receipts for the Pirates Press order, PFP-001, along with an explanation as to why this has taken so, SO long. Near the end of May, we at last had wrapped up getting everyone’s names on the insert and were ready to finally put in the order. Simultaneously, I was in the middle of packing up all of my things and moving. Truthfully, I didn’t have the time to order the records until I had moved apartments, but given that the Fan Pressing had faced extensive delays already due to Pozible and the insert, I didn’t want anyone to hear that it was delayed again because of my personal life. It felt super unprofessional, and I didn’t want anyone to think that I was the reason it was taking so long. So, I made a post at the end of May saying that the records were ordered, when in fact, they weren’t. I needed another week to finish moving, so I instead planned to order the record in the week after I moved on June 1st. The day I was set to move into an apartment across town, LITERALLY as I was on my way to sign the final lease and pick up my key, I get a call from the landlord saying they had found an older couple with a much better credit score and signed the apartment to them. My girlfriend and I had a U-Haul packed and ready to move, and suddenly we were blindsided and had nowhere to move. I had to take a week off my two jobs to look for a new apartment, I couch surfed at my girlfriend’s old place and, worst of all, I had to put off ordering the Fan Pressing until I solved the crisis going on in my personal life. Last week, we finally found a place and moved in, and I sat down last night and ordered the records. It had been a month since I posted that the records were ordered. But instead of telling everyone the truth, I thought I could just blame it on standard delays and hope that none of you would be upset with me. I want to reassure you: You WILL be getting this record. They are ordered. They are in production. The reason that it’s taken this long is purely because of me. I can’t express the amount of shame and guilt I’ve felt this past month about the delay in ordering the records. Attached are the receipts for the order. You can all track the progress using the order number, PFP-001. It doesn’t show anything right now when you track it, but it should refresh in a day or so. Test Pressings will take approximately 3 weeks, while final production will take another 5 to 6 weeks. The records will then all be shipped to the distribution center in the UK, which should take 1 week, and then shipped from the distribution center, which I’ve been told will take 2-3 days after they receive it. We’re looking at a ship date of about 9-10 weeks, roughly early September. To anyone that feels angry, disappointed and frustrated: you have every right to. I cannot begin to express how sorry I am to all of you. I should have been transparent that I had WAY too much going in my life for the past month, but I just didn’t want anyone to think the record wasn’t coming, or that I didn’t care. This really has been one of the coolest things I’ve ever been a part of, and I know I have let a lot of people down. From here on, the Fan Pressing is going to have my utmost attention. I hope that anyone who had doubts or felt that this was shady now feels better. Rest assured that the records are on the way. Test pressings did eventually arrive. But, the foil printing wasn't sticking to the sleeves and it took a few re-tries to get it right. I think they also messed up the feedback loop on the first pressing. Once they shipped the orders, Pirates Press forgot to put the hype sticker on 360 copies. Hopefully, everyone will eventually get their copy. aural stated there were originally more than 88 but a shipment was lost... maybe it will turn up someday. I made a real human baby in the time it took for this release to ship. it's really a shame to be honest. it's probably the year two thousand and eighteen and yet this band refuses to allow anyone to distribute this album in any format other than floppy disk. id love to own this on vinyl someday but that's like asking babe ruth to lay down a bunt with the bases loaded. oh well... I'm gonna just play the version I got off napster. eeyyyyup!